This pendant bag is worked flat using beaded knitting techniques (described in pattern). The fins are picked up and knit onto the fish body. 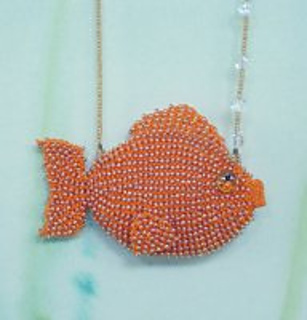 The necklace/strap is beaded on wire although beaded I-cod (instructions included) will work as well. 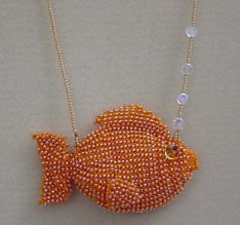 One hank of seed beads and one ball of DMC will make at least 2 bags.